Deepen your sense of the past at sights like Fremantle Prison and The Bell Tower. 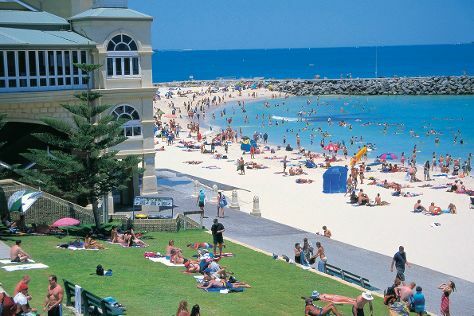 Escape the urban bustle at Cottesloe Beach and Caversham Wildlife Park. You'll find plenty of places to visit near Perth: Mullaloo Beach (in Mullaloo), Rockingham (Point Peron & Penguin Island) and Mandurah (Dolphin & Whale Watching & Silver Sands Beach). Dedicate the 22nd (Wed) to wine at some of the top wineries in the area. Next up on the itinerary: contemplate the waterfront views at Swan River, contemplate the long history of The Perth Mint, get to know the resident critters at Perth Zoo, and take in nature's colorful creations at Kings Park & Botanic Garden. To see photos, other places to visit, traveler tips, and tourist information, read our Perth online holiday planner . If you are flying in from United States, the closest major airport is Perth International Airport. Expect a daytime high around 71°F in May, and nighttime lows around 49°F. Cap off your sightseeing on the 23rd (Thu) early enough to travel back home.